Along together tells the story of a boy or girl (it’s your choice) who has lost their beloved purple dog called Rishu. 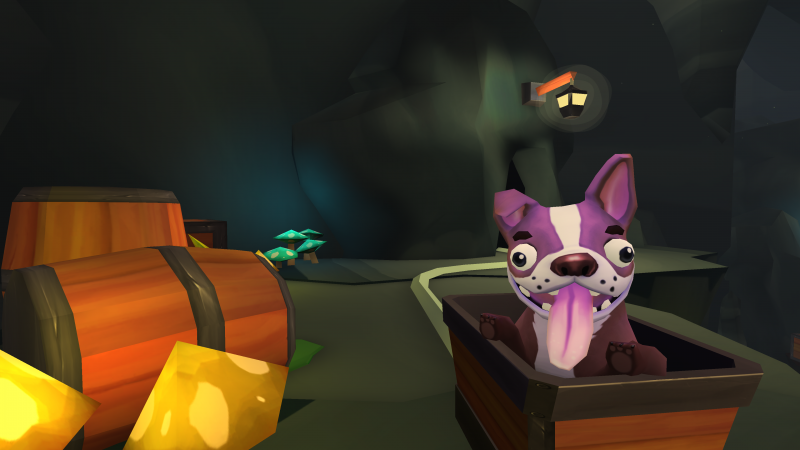 As the kids imaginary friend it is now your job to join them on the quest to find their dog, and that is what the story of the game is all about. Where it is a simple premise for a story, it is one many pet owners could relate to – I certainly could because Rishu is just about as mischievous as my own. As this kids imaginary friend it breaks the gameplay into two elements, you have to control the kid, and then manipulate parts of the levels as this giant hand you are portrayed as. It gives off the feeling that Moss gave a little, but this one is all about puzzles and does not involve any combat. 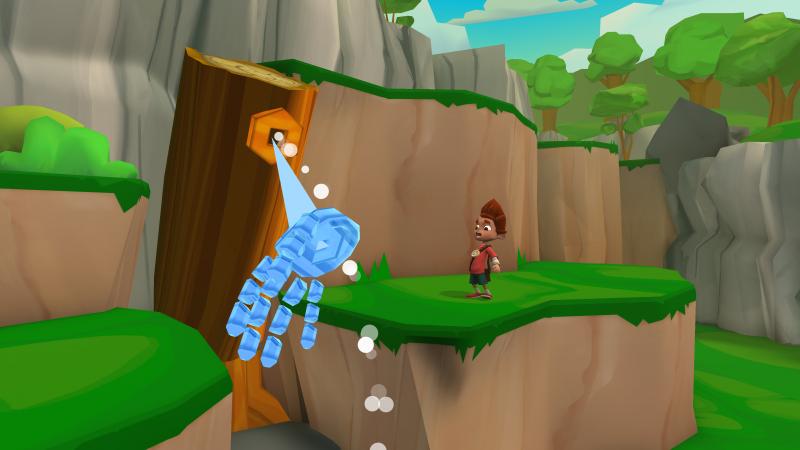 You will be using your power as this hand to grab object and create things like platforms and bridges. You will also be able to move parts of the levels with the kid stood on them to get them from one point of the levels to another. While manipulating the world you might need to get the kid to a switch and interact with it that way, this can open up a new platform or move one that is already in sight but you can’t move yourself. The worlds you will visit are filled these puzzles and are what stands between the kid and their dog. Turbo Button has explained this game as a point-and-click adventure, but to me it falls more under a puzzle platformer – which is not a bad thing. As I mentioned previously there is no combat in the game at all, you might need to scare off or trap some rather big looking crows, that put fear in the both the character and Rishu. But, these will not harm you in any way and only squawk if you get to close to them, which makes you back off. The only way you are going to either scare of trap them is by the use of slingshot. 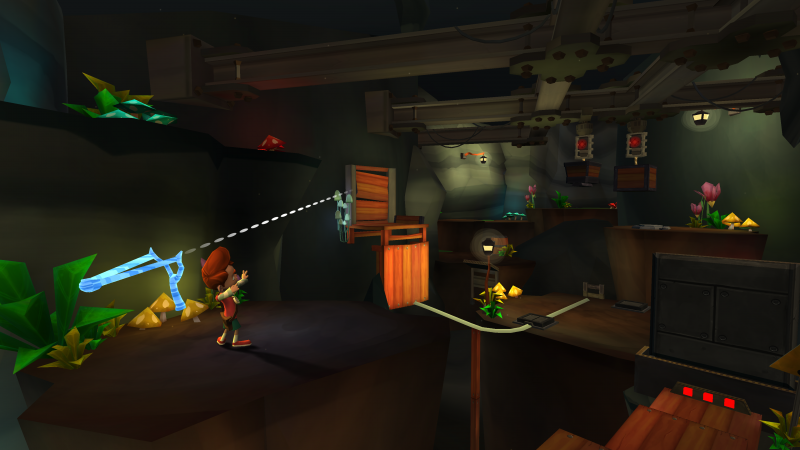 This is not always available, and will require you to get the kid to the ammo – which is a blue slime looking thing in the levels. Once at it, a slingshot will pop on your screen and it is your job to take aim and fire to lower the trap or shoot something that will fall and scare them. This slingshot also comes in for parts of the puzzle where you need to shoot set switches, but these are never too tasking to figure out. So, you may be thinking, is the kid ever in and danger?… The simple answer to this is no. There is no way for the kid to die or take damage, I attempted to walk of the edges of platforms and they’ll just make a noise and back away. In one to the levels I tried to drop something on them and they just move out-of-the-way. So, there is no way to die and have to start the puzzle again. The team at Turbo Button have brought a bright painted look to the game when it comes to visuals. 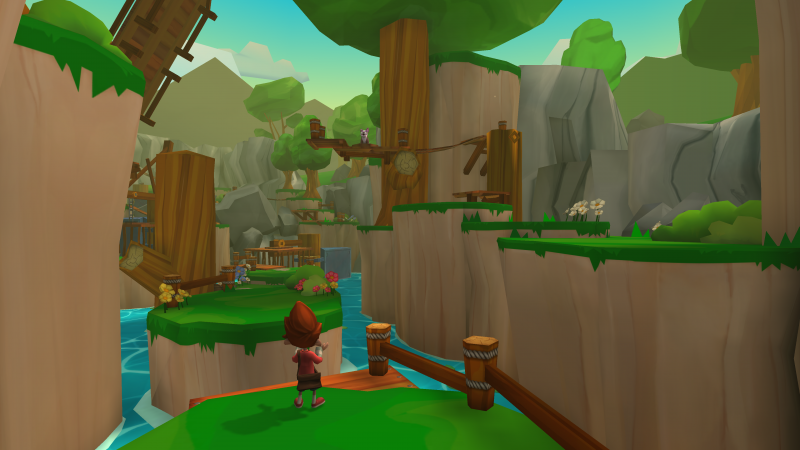 The game will not blow you away with the visuals like other games on the platform does, but the worlds really look like the maps on the level select, with both having that children’s painting look to them. Which really isn’t a bad thing because it suits what the game is about and the story it is telling. Also I would say it is one of the first games I have played on the PSVR where they have not used the blurring effect to the items in the background. The whole game and its worlds are always crisp and clear – so kudos to Turbo Button for that. This is another game that does come with an intelligible speech, it is more like mumbles, but the animation of the gestures makes it clear what they are trying to say – whether the kid is talking to you or Rishu. They then add in some nice relaxing music and great sound effects to pull together a great use of audio, that will keep your attention and immersion in the world, as this kids giant imaginary friend. The game is really made to played seated and only supports the Duual-Shock 4. The reason I say to be played seated is you don’t have to physically grab the objects in the worlds, there is pointer coming from your hand that you just point at the part you want to manipulate – which are shown by a sort of cog. 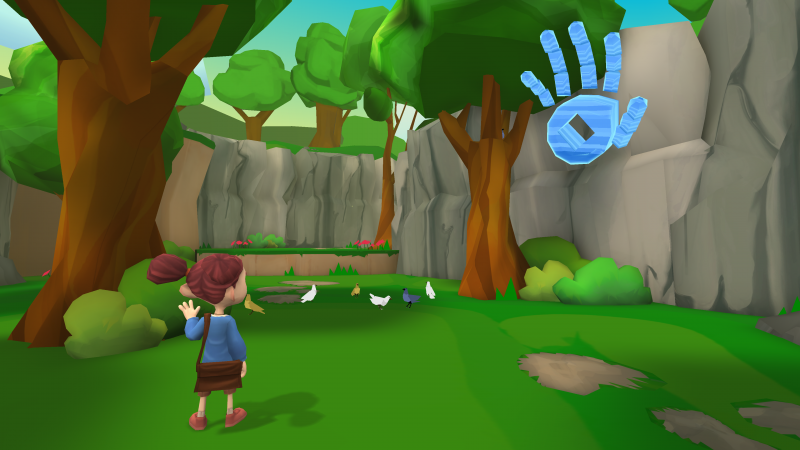 The pointer is moved by motion controls, and you will by using the trigger to grab the objects. Apart for this giant hand, you also have to control the character, this is done using the left analogue stick, and the X button to pull the aforementioned switches in the levels. That is it for your controls in the game, nice and simple and not a control scheme that people will struggle with at all. One issue I had with Floor Plan was the how short the game was, well I am happy to report that Along Together is a longer experience. It comes with three different worlds to explore, and if you just want to get through the worlds it is going to take you around two and half hours to complete. But, the team have also hidden a collectable in each part of the worlds, and if you want to find all these you really do need to keep an eye out and explore every part of the level. If you want to get all these it stretches that playtime to around four hours. Along Together is a really nice family friendly game, that will be enjoyed by older and younger members of the family. Where you won’t find anything that hasn’t been done before within the puzzles, what Turbo Button has done is make a more refined version of these puzzles. With this being the case the puzzles are not to complex, but some will even have the more puzzle savvy gamers stumped for a short time – meaning your progression in the game is not blocked for long and it does not become frustrating. Where some might that £15.99 is a bit steep for what the game is offering, I really enjoyed my time spent playing this title, and would certainly say it one worth experiencing.